There are a number of clever ideas you can use to make your small bathroom seem larger brighter, and less cluttered without having to design an expensive remodeling and construction project. A few ideas about small bathroom designs and makeovers. Coming up with bathroom designs that make your bathroom seem larger and more spacious is do-able. Be adventurous if you want to. Come up unique bathroom designs to please your own eye. With your new bathroom design you may even want to treat the powder room to a more adventurous look than in the rest of your home, indulging in lavish tile work, vividly colored wall-covering, ornate mirrors, or a unique style of sinks and fixtures. Maybe decorate the room to resemble an aquarium or even a desert scene. Choosing light soft colors can make your bathroom look bigger and more spacious. On the other hand dark and bold colors make the bathroom appear smaller and more intimate. If you wish to use wallpaper use subtle designs and avoid large prints and busy patterns. Light colors for the flooring will help make the room appear roomier and more open. The most popular colors for a light bathroom floor are tans, light grays, and light blues. In the same way, additional lighting helps to open up small spaces. Think about adding some light fixtures or using larger wattage bulbs if appropriate. Adding a window or a skylight can work wonders, even making a window larger could make a huge difference. When selecting fixtures for your new bathroom design, keep in mind they are going into a small space. Choose simple designs made from smooth surfaces, such as ceramic and marble, and opt for light, neutral tones. Another way to make a bathroom appear larger is to replace a large vanity or countertop with a slimmer, pedestal sink. Pedestal sinks come in many different styles, colors, and materials, making it easy to match any d�cor. Placing a pedestal sink in the bathroom can open up the space by as much as ten percent. In many cases greatly reducing the number of items stored the bathroom can really make a difference. Storage shelves, hampers, and decorative items take up valuable space. The bathroom will appear much larger if these items are removed. Consider putting laundry hampers in the bedrooms instead of in the bathroom. Adding more mirrors to the bathroom designs can help the room to appear bigger. Placing additional mirrors in the bathroom will help to capture all of the available light and reflect it back into the room to make it brighter, and can add depth to the room, as the mirrors reflect each other and make the walls look farther away. Replace your old toilet with a new trendy one-piece toilet that has a cleaner look and is also much more compact than your standard two-piece toilet . Any bathroom project, big or small, will benefit from careful planning. Take some time to think about these practical points before you begin. While you are remodeling or re-decorating is a perfect time to supercharge your water heater with a Chilipepper hot water appliance! Get your hot water FAST and save time, water, energy and money! 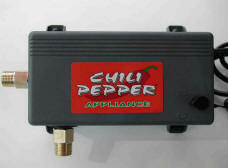 The Chilipepper is easy to install, usually taking less than an hour. Add the convenience of quick push-button hot water to your bathroom remodeling project!